There’s no avoiding the sweltering summer heat, but you can make sure your home keeps its cool once the temperature starts to climb. 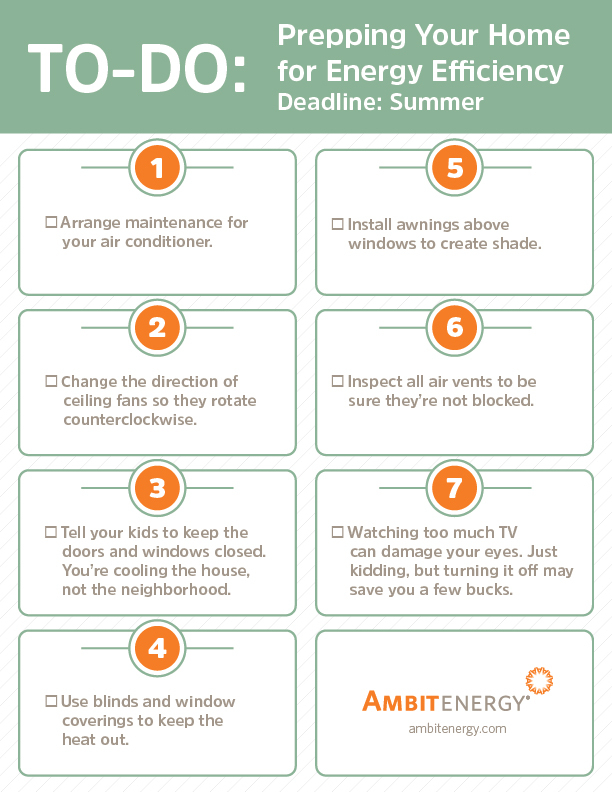 Read on for a few ways to get your home ready to beat the heat this summer and print out our handy checklist to ensure that you stay on track. A/C Maintenance – You want to be sure your air conditioner is in prime condition. It’s best to schedule a maintenance check this spring to avoid a mid-summer breakdown. A ceiling fan is also a good alternative to keep the cool air circulating. Ceiling Fans – Since we’re talking about ceiling fans, using them will allow you to keep your air conditioner at a higher temperature which will save you money on your energy bill in the long run. You can use your dryer sheets to keep them dust-free and clean year-round. Seal It – Proper insulation keeps the temperature low inside of your home. You should seal all doors and windows by using caulking and adding weather stripping, if needed. Dryer Vent – Another way for hot air to sneak inside of your home is through your dryer vent. By detaching and cleaning the vent yearly, you can ensure the hot air from your dryer is outside where it should be, instead of inside. Cooking – Summer is a good time to spend time outside. Instead of using your oven, which heats your entire home, think of using your microwave, indoor or outdoor grill. Bathing – While a long, hot bath is a good way to relax, you might want to save those baths for winter. Try a short shower instead to minimize heat and keep cool. Summer is the time of year when you want to spend time outside. However, you want to make sure that while you’re enjoying the sunny weather outside that you’re keeping your home cool inside. These tips and our helpful checklist will help you make sure that you’re keeping it cool all summer long.